It is the Boshin War (Aizu War) that this castle makes a dramatic appearance in the history, but it is a castle that did not fall forcefully until it lasted for a month and finally surrendered to a new government army weapon with modern weapons. However, many lives such as "White Tiger Corps" and "Shinsengumi" have died and it has become a stage of tragedy. Tsuruga castle is a great castle with a beautiful white wall that became the setting of the Boshin War. Since black tiles were dubbed in 2011 by the "red tiles" at the time of the War, it is a figure that is even more reminiscent of those days. 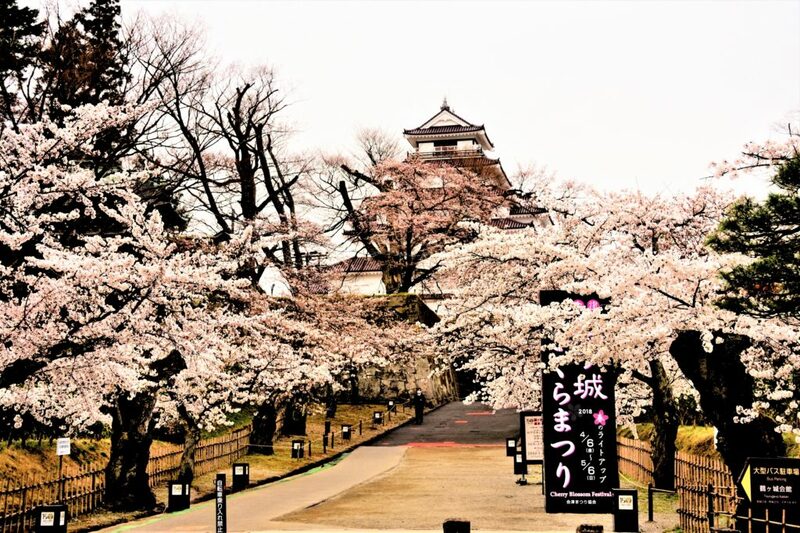 Tsuruga Castle (Aizu Wakamatsu Castle), a symbol of Aizu, is the number one cherry blossom spot in Aizu where about 1000 cherry trees bloom. Tsuruga castle and cherry blossoms harmonized wonderfully on this day when we visited early in the morning. Various types of cherry blossoms are planted around Somei Yoshino, and you can admire the blooming cherry blossoms for a long time, gradually shifting the time. The original scenery of the post town that remained miraculously "Ouchi-juku"
Go through the "Ouchi-juku Kobushi Line" from Aizu Wakamatsu to Ouchi-juku. Private houses with thatched roofs are lined up, the scenery of the Edo period is carefully preserved, and the entire scenery is wonderful. About 400 years ago, Aizu Nishi Kaido (from Nikko to Aizu) was an important road as a transportation route during the Edo period. As a post town along the way, it prospered as a post town for Daimyo (feudal lord) and travelers heading for Edo in Sankinkotai (System of Mandatory Alternate Residence in Edo). The reason why Ouchi-juku remains as it was at that time seems to be largely related to getting off the main traffic road since the Meiji era. Speaking of Ouchijuku, "Negi-Soba (Backewheet noodle)" is famous. Among the many soba shops, I chose "Someya" where you can also enjoy delicious Soba and Mochi (rice cake). The green onion is an alternative to chopstics, and it might be difficult to get used to eating Soba with green onion. However, you can enjoy the best taste by tasting Soba, which has a strong full-bodied taste, while biting little by little as a flavor. The unique culture "Negi-Soba" seems to have spread the culture of "Takato Soba" in Nagano Prefecture at the site of Aizu. With the meaning of the celebration, "Slow, long like green onion, live long until white hair grows", it seems that it came to add green onion. The freshly made Kinako Mochi (Flour cake) also felt happy in an atmosphere that reminds me of the teahouse of that time. From Ouchi-juku, I visited Kitakata City, which prospered as a gathering place for supplies during the Edo period. Kitakata City has been popular for sake making since ancient times, and even now there are ten sake breweries, making it a "sake town". "Kita's Hanashuzo", founded in 1918, is one of the most "young" sake breweries. On the other hand, it is becoming the most popular brewery now. Kita Hikaru Soujo, named "Kitanohana" from the dream of aiming for the first sake in Kitakata, was founded in 1918. Kitakata who many travelers gather as "Kitakata town of Historical Kura (storehouse)". I feel nostalgic, it is a town with a simple taste. The reason is that Kitakata's storehouse was not created for sightseeing, but people still live, use it, and play a living role now. There are stores in the back alleys and villages of the suburbs, as well as the main street, and the number is said to be 4,200. Speaking of Kitakata, you can not go home without eating Kitakata Ramen. It is a popular store "Hasegawa" which is a little away from the center of Kitakata. There are tents, chairs, and cold barley tea on the table for the waiting guests, and you can feel fine attention. The flavor of soy sauce and simmered fish is spread and light. After being beaten, the resiliency of the noodles is strong, and the soup is often entangled. I finished the meal quickly, leaving a deep aftertaste. A time-slip trip around Aizuwakamatsu, Ouchi-juku, and Kitakata. You will be able to walk away from this world for a different time.